Tony quite often gets excited when a new mould arrives at the workshop, bless him. I think though that he will be particularly happy with the new one that we’ll be trying tonight. Having written a rambling piece about the new unit bases for Celtos, I mentioned that we were already in the process of making resin cast bases, but neglected to show any pictures. The bases have been 3D modelled and printed so the slots for each base are precise and fit perfectly. In this next picture, the bases have been given a textured surface and then sprayed with primer – if we didn’t do this then the texture material would be pulled off by the mould. The next task is making RTV (Room Temperature Vulcanising) rubber moulds for each base (multiple moulds of the more common bases). I make these three at a time, to avoid too much wastage of the rubber. The bases are lined up in mould formers (in this case, they are very cheap metal flan dishes from Asda !) ready to have the rubber poured over them. The scales and calculator are to work out the exact amount of rubber I need (it’s too expensive to mix too much and then throw it away), the calculations are scribbled somewhere on the newspaper ! Hopefully we should have some sample castings to show you soon. One of the most tedious parts of getting a model into production is the unglamourous but very necessary job of cleaning up master castings (known as ‘tins’) ready for the production moulds. I find this part of the process extremely dull (I may have mentioned this before …) but it has to be done. These castings have to have any small vent sprues, flash or mould lines cleaned away and filed smooth – otherwise we’ll just reproduce these imperfections when we make the production mould. We always cast more items then we need for the production mould, because castings that might seem OK in the workshop on a cold evening may not always pass closer inspection when cleaning up. Any pitting or less than perfect detail will see the casting rejected. I spent my evening yesterday with some of the tins for the Bizon production moulds. 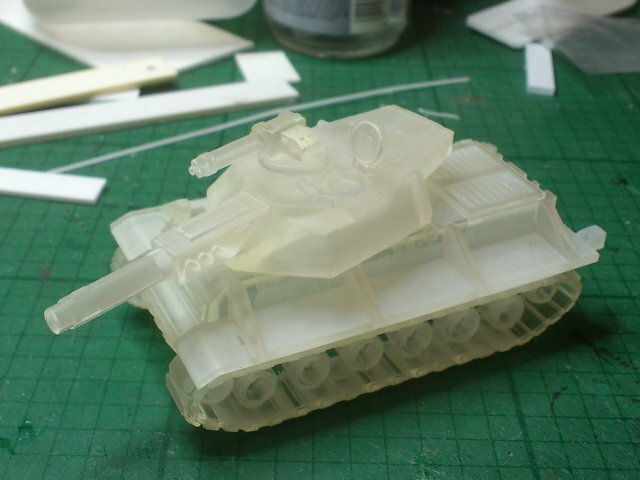 The Bizon in particular has a lot of pieces and will need a lot of moulds – some of these will be shared with other models (such as the track units, side-skirts and gatling turrets) whereas others are unique to this model (track-guards and turrets). In this photo you can see a selection of bits – side-skirts and external stowage (bottom left) which are cleaned up and ready for the production mould, some turrets (top left), one with gun which is cleaned and ready and a batch of others waiting for a visit from clippers and file, and some raw track-guards (bottom right) which I’ve yet to tackle. Proper photos later in the weekend, I promise ! For the last year or so we’ve been experimenting with 3D printed models in various shapes and forms. We’ve been playing with different printing materials from different printing houses, different types of mould, different ways of preparing the models before moulding and so on. Some have been successful, such as the ranges of 6mm and 15mm SF desert buildings which have sold so well they’ve funded the experiments of other types of models. Others have been less successful, and have resulted in destruction of some rather expensive masters. Yet more have been previewed here on the blog and then disappeared from sight without further mention. And yes, we know that lots of other companies have pretty much mastered the process and there are mould-making and casting specialists out there that we could have turned to and got them to do everything for us. But we’re nothing if not stubborn, and we have been convinced that we could master the process ourselves and keep everything in-house. Pleased ? That’s a bit of an understatement … I had a grin like a Cheshire cat all the way home ! On this close-up you can see nice smooth, crisp castings which fit together perfectly. I’m in the middle of cleaning up castings for 58 arms and 18 torsos to make the production moulds. After much debate, we’ve decided on a solution of torsos with cast-on left arms and separate weapon arms (as much as anything, because we don’t think cast on weapons arms would be possible in the poses we would like). The arms have already gone off for moulding, but the torsos are lying on my desk being filed and sanded to remove mould lines and casting sprues. And, by George, it is tedious work … ! I took a photo of the torsos lined up just as an excuse to take a break and write this post ! The filing and cleaning is all done, the next stage is to take dremel and superglue and attach the left arms. After that, the joins need to be filled with green stuff – only then can they go off to Phil to be moulded. It’s a race against time as I leave for a week in France on Saturday, and they need to be ready so Phil can mould them while I’m away !